season with 29 goals scored and 52 total points. The question was sort of a contradiction in terms in today's NHL, where teams always are looking for more goals. 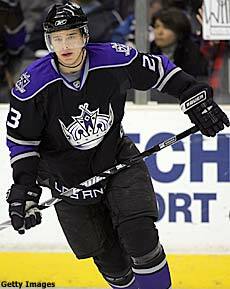 "Ask him if he would rather score a goal or make a big hit," St. Louis Blues coach Andy Murray said when asked what stood out most about Los Angeles Kings' power forward Dustin Brown. "I'll bet you get a big smile from him." "He plays like he's from Southern Manitoba rather than upstate New York," Murray laughed, referring to the culture of Western Canada hockey players who usually come to play the game with a grit and enthusiasm that is contagious. "He'll do whatever it takes to make an impact in a game, whether that means make a big hit or score a big goal ... or anything in between. "I remember early in the 2005-06 season seeing him play a game against Anaheim in which he hit Chris Pronger once and (Pronger) got a look of annoyance that a young player would challenge him in front of his own net. Then, later in the game, Dustin tried to bowl him over in the corner. The look of anger on Pronger's face was priceless. This kid had gotten under his skin and took him off his game." "Yeah, I'll never forget that," said Brown, a 6-foot, 200-pound, 23-year-old right wing from Ithaca, N.Y. "You don't want a big guy like Chris Pronger angry at you. But I think it was those two hits that started getting me noticed. It certainly wasn't because of my goal-scoring." Two seasons later, Brown is making an impact as more than just a one-dimensional player. He hits. He scores. And then he hits some more. Brown credits the hard-charging, big-hitting part of his game to Colorado Avalanche and former Kings center Ian Laperriere, a feisty competitor who doesn't back down from anyone. Brown's 258 hits in 2006-07 were second in NHL to Ottawa's Chris Neil, who had 288. He had 139 more hits than the next closest teammate. Plus, Brown showed a greater awareness around the net with 17 goals. This season, his production in both categories has taken a quantum leap. Through 67 games, Brown leads the League with 281 hits and is tied for the team lead with 29 goals. And, oh yes, he did flash a big smile when he was asked if he would rather score a big goal or make a big hit. "I don't know," he laughed. "I made it in this League by making a few big hits. That was my way to create a little time and space for my teammates and motivate my team. Now I guess I'll do whatever it takes to make the Kings better." Brown was part of the 2003 Draft, which is considered one of the top three drafts of all-time along, with 1979 (Ray Bourque, Mike Gartner, Rick Vaive, Craig Hartsburg, Paul Reinhart, Brad McCrimmon, Duane Sutter, Michel Goulet, Kevin Lowe), and 1993 (Chris Pronger, Paul Kariya, Jason Arnott, Adam Deadmarsh, Jason Allison, Saku Koivu). Brown is right up there in performance others from his draft class, like Marc-Andre Fleury, Eric Staal, Nathan Horton, Nikolai Zherdev, Thomas Vanek, Milan Michalek, Ryan Suter, Dion Phaneuf, Jeff Carter, Brent Seabrook, Zach Parise, Ryan Getzlaf, Brent Burns, Mike Richards and Corey Perry. Brown started in hockey by following around his older brother, Brandon. It wasn't long, though, before he was making his own way. And he was doing it despite the breakup of his parents, Bryan and Sharon. "Both my parents were always there for us, so it wasn't like we had a big obstacle to overcome," Brown said. "They have been there for every big decision, every big event." Brown came into this season more prepared than he's ever been since he led the Ithaca High School Little Red to the New York state hockey championship in 2000, when he led the team with 32 goals (that was one year after Ithaca High lost in the final and Dustin was the only eighth grader on the squad). He said the fast start is a result of a more determined offseason of training once he returned to L.A.
"I think I'm a little quicker and faster. I'm a little lighter. That obviously helps," said Brown, whose quickness has enabled him to jump into holes more easily and get his shot off faster. "Nutrition. Training. That's something I never concerned myself with before. I'd just put on my skates and jump on the ice and play. With more responsibilities, I realized I had to be more ready for whatever this season had in store for me. That's why I made sure that last summer would be the hardest I ever worked in the offseason, and I think it's paid off." 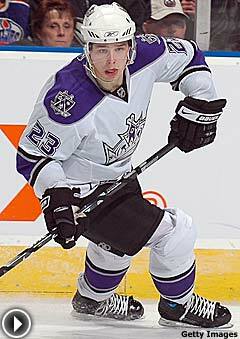 Off the ice it's paid off as well, as the Kings gave Brown a six-year contract in October. Part of Brown's growth is maturity in the game, but most of it is a maturity he developed off the ice this past summer, when he married his childhood sweetheart, Nicole, and then the couple had their first child, Jake. "You grow up fast when at 18 you're in the NHL ... in Hollywood ... you see Shaquille O'Neal at one of your games along with all sorts of movie stars, like Cuba Gooding Jr. and Goldie Hawn," he said. "You're wide-eyed, naive. You're wondering if you're going to be able to do enough to stay in the NHL. "When you start to feel a little more comfortable, feel like you belong ... then you get married and the terms accountability and responsibility on the ice to your teammates take on a completely different definition. You come home to a wife and son. That's the ultimate in having to grow up in a hurry." "He's a throwback to about 15 years ago when players came into this League and looked for hits up and down the ice," Kings veteran defenseman Rob Blake said. "He hits like a truck. But he's never out there running around, out of control." Brown's learning curve is part of the self-maturation process Kings coach Marc Crawford envisioned. "I had the pleasure of playing in Boston with Cam Neely when I was younger and the honor of coaching Adam Deadmarsh as he was growing into a pretty good power forward in Colorado," Crawford said. "Dustin is somewhere in between. He shows you the quickness and skills of a young Neely. And he just loves to play the game and be gritty and physically just bowl over people like Adam. "What is most exciting is that he is learning that he can create room for himself." What is most exciting for Brown is that he doesn't have to decide if he'd rather score a big goal or make a big hit, because he's doing both with great regularity.